I've been scouring the web for people's opinions on the best translations of the greatest epics: Homer's Odyssey, Homer's Iliad, Virgil's Aeneid, and Dante's Divina Commedia. 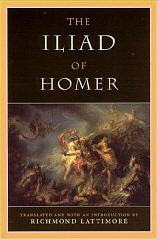 Homer's Iliad, translated by Richmond Lattimore (1951). Close race between Lattimore and Fagles (1990). 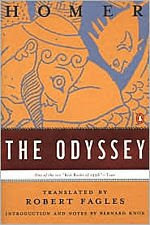 Homer's Odyssey, translated by Robert Fagles (1999). Another close race with Lattimore (1965). Dante's Inferno, translated by Robert Pinsky (1995). Widely regarded as superior. 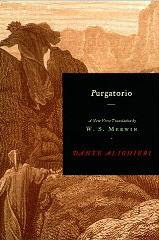 Dante's Purgatorio, translated by W.S. Merwin (2000). 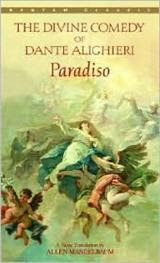 Dante's Paradiso, translated by Allen Mandelbaum (1982). Those quotations give me goosebumps. posted by Jonathan at 4/12/2009 05:16:00 a.m.
Dante's 'Inferno', translated by Ciaran Carson. This is the only overlap I have with your list, and I slightly preferred Carson's translation. Pinsky shortens some of the text, and some of Carson's choices are surprisingly direct and understandable while keeping the meaning. I've linked to Granta's hardcover edition, which is nicely typeset with an intriguing cover (and was probably part of the selling point to me). Cervantes' Don Quixote, translated by Edith Grossman. This translation is so preferable to past translations that I lugged back the 940-page hardcover. Now available in softcover. Beowulf, translated by Seamus Heaney. Dostoevsky's Notes From Underground, translated by Richard Pevear and Larissa Volokhonsky. The translation that got me started on this task. Read a Salon article about how this translation finds jokes and meanings that were missed or mistaken in past translations. Even the opening few sentences is a huge improvement on others. I'm linking to the handsomely-printed Everyman's Library edition. Voltaire's Candide, translated by Theo Cuffe. I'll admit it, half the reason I bought this version is Chris Ware's fantastic cover. However, it is a genuinely great translation — truly funny. My father worked on a musical version of Candide, directed by Hal Prince with music by Leonard Bernstein and lyrics by Stephen Sondheim, just before I was born. Bonus: Molière's Don Juan, translated by Stephen Wadsworth. I saw this version performed in Seattle a few years ago, and it was one of the best theater experiences I've had — I got chills in several places. Good luck finding a copy. Prodded by this post, I'm making another attempt at finding it. I ended up with a translation by Richard Wilbur, which is fine, but read what The New York Times and The Washington Post had to say about Wadsworth's version to understand how other translations can't compare. By David Warner, at 4/12/2009 11:28 a.m.
No love for T.E. Lawrence's Odyssey? I always liked the idea of a translation by such an adventurer. Not that I've read it - his Seven Pillars of Islam turned me to cardboard with boredom! By Thomas David Baker, at 4/12/2009 2:50 p.m. Thanks guys - I enjoyed reading your recommendations! By Jonathan, at 4/13/2009 1:00 a.m.
And David, that Carson quotation from the Inferno compares favorably against the Pinsky quotation. Checking it out now. By Jonathan, at 4/13/2009 1:06 a.m.
as a native italian speaker, I always feel the english versions of dante's works lack some kind of mh.. aulicity is not a word I guess, maybe gravity? By riffraff, at 4/13/2009 9:40 a.m.
riffraff, you are lucky to be able to read the Divine Comedy in its original language! By Jonathan, at 4/13/2009 8:01 p.m. In The Joy of Reading, Charles Van Doren writes: "Translations of both epics by Richard Lattimore are said to be closer to the Greek than most others but perhaps as a result they are not easy to read. A more passionate version of The Iliad by Robert Fitzgerald seemed preferable when it appeared thirty years ago. But none of those, in my opinion, can be compared with the translations of both poems by Robert Fagles that were published at the end of the last century. His Iliad is powerful, almost overwhelming, his Odyssey utterly charming, and I recommend them to anyone who wishes to read—or reread—Homer's two great epics. I can't imagine any reader not being transported by Fagles into Homer's magical world." By Jonathan, at 4/20/2009 11:49 p.m. I agree with the comments on most books, but I think John Ciardi's Dante has what the native speaker is looking for. I am not a native speaker, but know enough Italian of the period to see the beauty and the gravity of that work. By Judith, at 6/29/2009 3:34 p.m. I actually have Ciardi’s translation, but I read a bunch of reviews saying that these other ones are better. By Jonathan, at 6/30/2009 1:10 a.m. I did not enjoy Fagles' translations of the Iliad, I dropped it without finishing. Recently I managed to finish Rieu's prose translation, but I feel there must be something better out there! 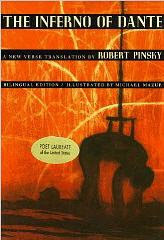 By the way, Grossman's translation of Don Quixote was great! Don't hesitate. By Anonymous, at 8/06/2009 8:20 a.m. I have now read both Lattimore (Iliad) and Fagles (Odyssey) and can say this: Lattimore isn't as hard or dry as some make him out to be, whereas Fagles beautifies Homer's text a bit with some evocative word choices. So if truer fidelity to Homer's original is at all important to you, prefer Lattimore; if you want emotionally charged language and you are OK with some embellishment to that end, prefer Fagles. By Jonathan, at 9/12/2009 1:29 p.m. Sorry. Meant to type "Midway ..." It's late. By Tom Paine, at 2/20/2012 12:29 a.m.
Great article! In my opinion, Robert Fagles is the best for Homer and Virgil, and Robert and Jean Hollander are the best for Dante. I am actually working on my own rendering of the Iliad, in the meter of the Greek (dactylic hexameter). I'm publishing it on my website (www.jsimonharris.com) in weekly increments, so you can read it hot off the presses as I write it, if you want to follow along. I encourage comments and discussion as well. By Josh Harris, at 1/11/2017 6:54 p.m.